Wialon GPS Tracking is the set of tools allowing to work with the interface and is a software for fleet management, logistics and intelligent GPS tracking. Wialon GPS Tracking gets the access to the telematics data that Wialon Data Center receives from more than 403 types of different GPS/GLONASS devices. The new version is more stable, the performance is higher. Wialon GPS Tracking is designed primarily for companies that integrate GPS/GLONASS tracking systems, provide logistics and fleet management services. 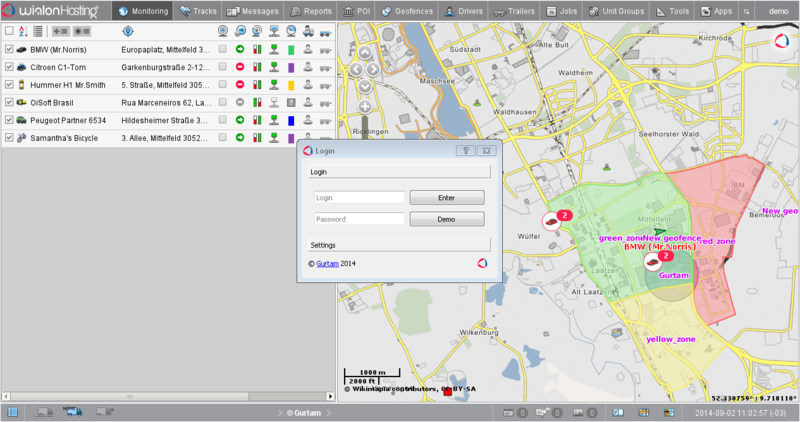 Wialon GPS Tracking 1.2 is a newest verstion of specialized software application for GPS tracking. You can easily download and install it on your PC and use all the broad functionality of professional GPS tracking solution. The general features of the application include: fuel consumption monitoring, editable template-based reports, SMS or e-mail alerts and notifications, as well as controllable routes with check points. The app has a user-friendly interface, translated into many languages. Wialon GPS tracking supports different kinds of maps and provides the possibility to mark your favorite POI and create geofences. Wialon GPS Tracking application helps fleet owners to monitor the work of each vehicle in real time mode and quickly detect any deviations from the route, operating irregularities or violations. One more distinct feature of Wialon GPS Tracking is its ability to work with almost all kinds of GPS devices: personal GPS trackers, vehicle GPS trackers and AVLs (Automatic Vehicle Locators). Nowadays there are more than 500 types of supported devices.